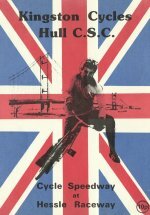 The Home Page of this website (and the section devoted to the immediate post-war period) initially relied for its information about the early days of the sport on Tyneside on the memory banks of the late Jack Hiscock (and his collection of photographs). 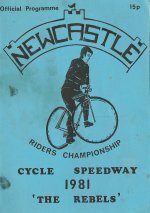 Some fresh facts came from research in the archives of the British Library, but there was nothing to help to fix the earliest date when the sport started on Tyneside. 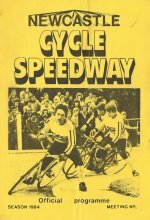 The British Library archives did, however, throw up the name of a Mr. Edmund Hall of Wallsend, who was involved in the organisational side of the cycle sport in 1948/9 (it turns out that he was a teenager at the time), and when webmaster John Skinner recalled meeting Edmund Hall at consecutive Wallsend Festivals (2005/2006) when John was manning the Diamond Geezers speedway stall. 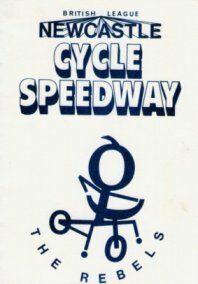 Edmund had an organisational role in Wallsend's Festival and was delighted that the speedway stall was part the festival. All of this stimulated an attempt to get in touch with Edmund especially after Jack Hiscock's recent passing. Fortunately, it turned out to be relatively easy to find Edmund, and even more fortunately he has an excellent memory, and photographs from the era. 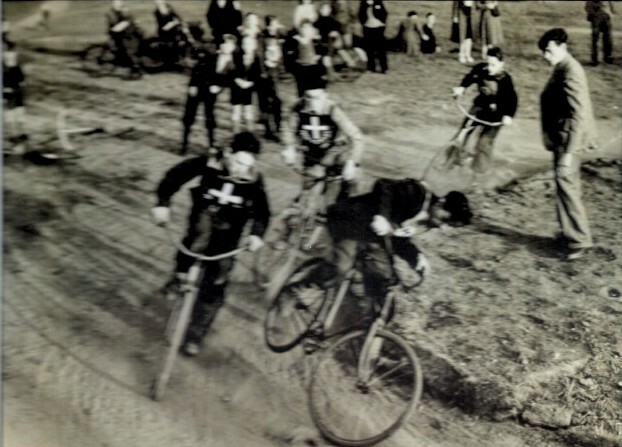 His team was Holy Cross Demons of Wallsend, for which he was rider/secretary. 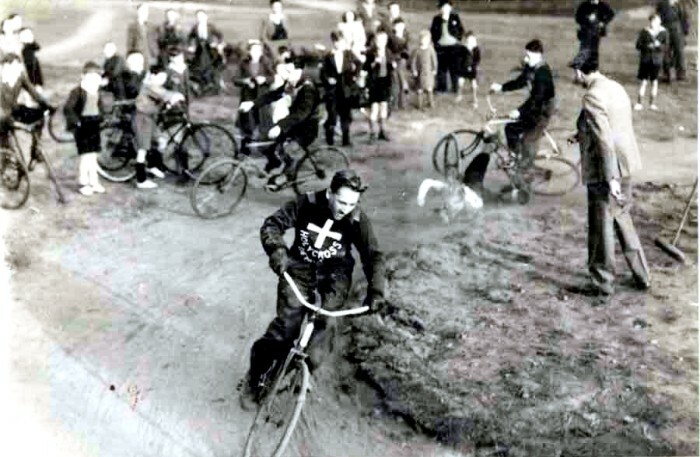 The Demons were certainly active in 1948, and may have taken to the track first in 1947, which would be our earliest-known date for the sport on Tyneside. 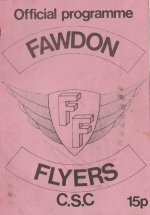 Some sort of league arrangement did exist, as Seaton Delaval appealed to be admitted to the competition, although the other members did not appear too keen to have them join, and raced them only in challenge matches. There may have been three reasons for this reluctance to admit them - Seaton Delaval is almost ten miles from Byker/Walker, and still further from Bensham, the Seaton Delaval Ram's Head Curse is well know north of the Tyne, and lastly, the Rams' track had a concrete surface, at least in part - so it may have been a combination of distance, superstition or skinned knees which deterred other teams! 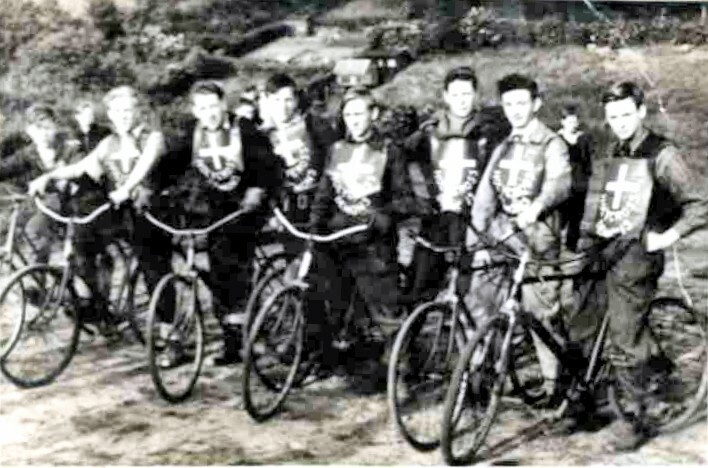 Photo1: Holy Cross Demons captain on bike, Jimmy Pringle, Edmund Hall fifth from left wearing light overalls and holding helmet. 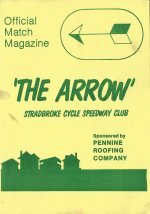 At Bensham Broadsiders Track at Gateshead. The photo was taken at the Bensham Broadsiders track, with a large overhead crane in the background. Photo 2: Holy Cross Demons Team at their Holy Cross Wallsend Track. 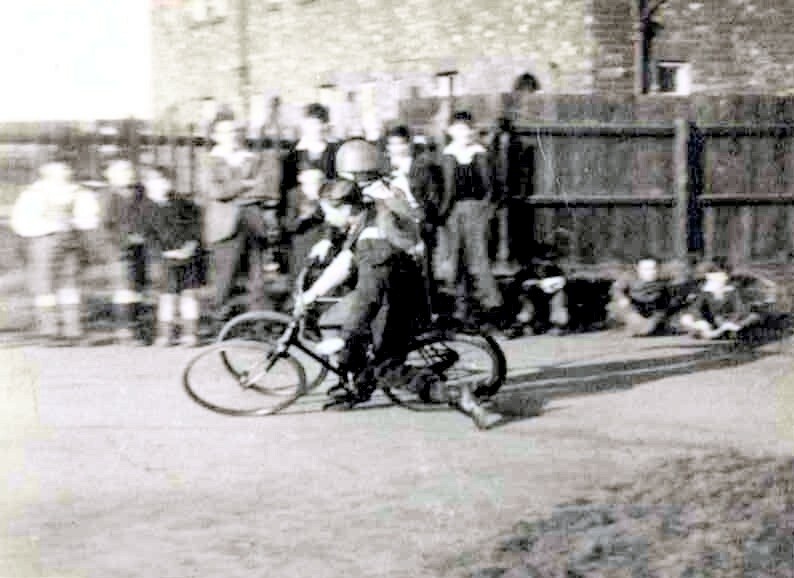 The Holy Cross track was in the Burn Closes in Wallsend Dene. Photo 3: Holy Cross Demons captain Jimmy Pringle on the inside at the Seaton Delaval Rams track. Jimmy is keeping his feet well clear of the bricks! Photo 4: Holy Cross Demons at Holy Cross. 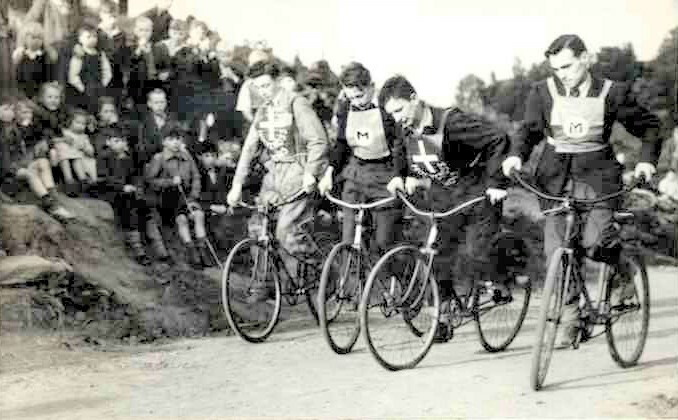 Riders gating, Edmund Hall and Peter Campbell competing against the Byker Meteors. Photo 5: Holy Cross Captain Jimmy Pringle out in the lead as an accident happens at the rear! Photo 6: Riders neck and neck, Walker Mustangs rider seen leg trailing on their fast track at Walker against the Holy Cross Demons. Photo 7: Another photo (see above), from the Holy Cross Demons v Byker Meteors match which was included in the 2013 calendar of the Wallsend Local History Society. John says: These 2 photos were sent to me by my friend Les Banks. 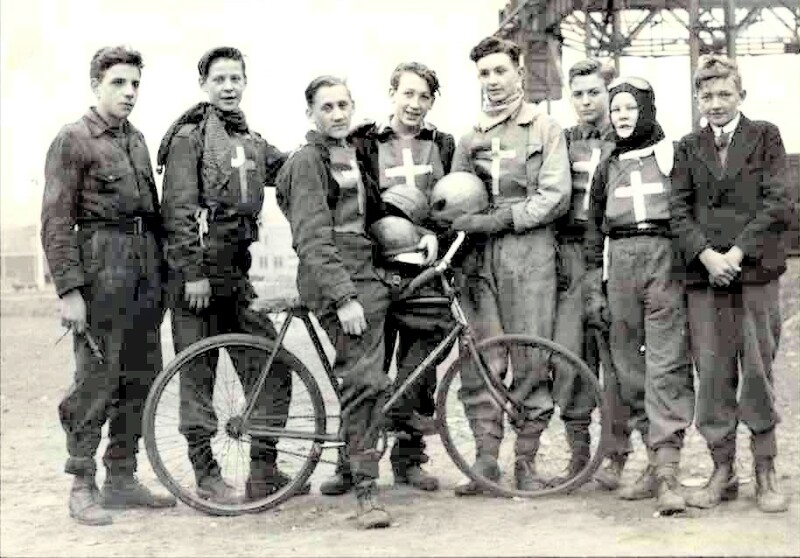 They are of the Holy Cross Demons circa 1947. I like the dog left hand bottom corner it is smiling! 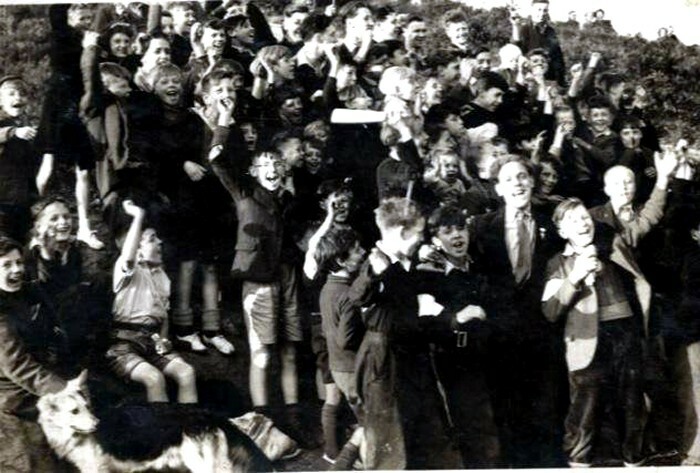 The Byker Meteors track was on Byker 'Prairie', off the Fossway, and the Walker track was located off Walker Road. 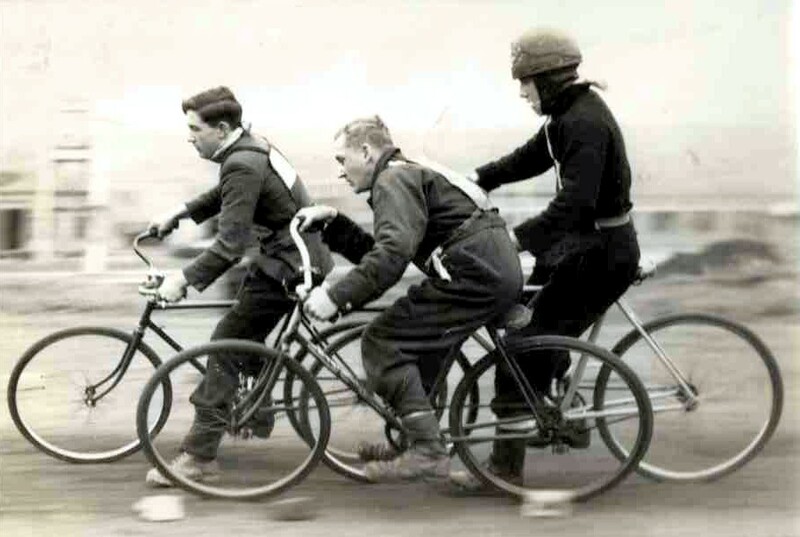 Edmund was still riding in 1949 but was then called up to do his National Service, and by the time he was demobbed in 1951 the sport had died away on Tyneside. 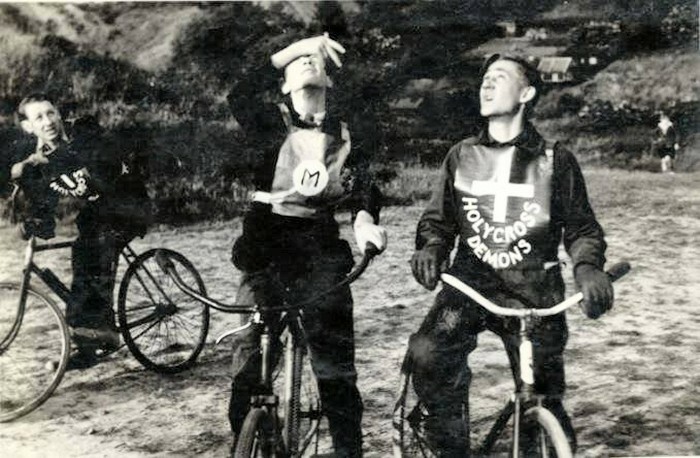 He never lost his love of cycling in general, however, and fortunately retained his photo collection of those days. The Holy Cross track was in the Burn Closes in Wallsend Dene. There was another track in Wallsend - although in a more urban setting than Holy Cross. It was off the High Street by the Ritz Cinema, opposite Gordon Square. 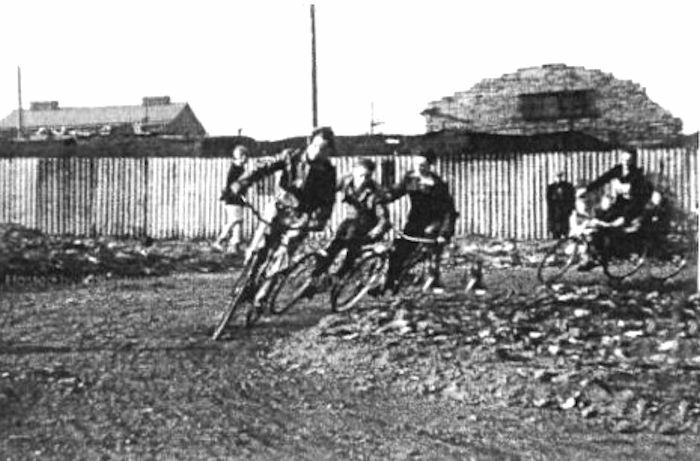 Given the latter's forbidding reputation (the 'Gorbals of Tyneside' was one description) it is unlikely that too many teams were willing to race them there. 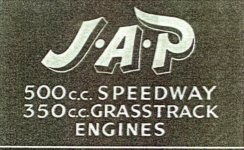 Information has also been received about other tracks south of the Tyne (we already knew about Bensham and Team Valley in the Gateshead area, and the South Shields club, and now Carr Hill and Pelaw - both also in the Gateshead area - can be added to the list). 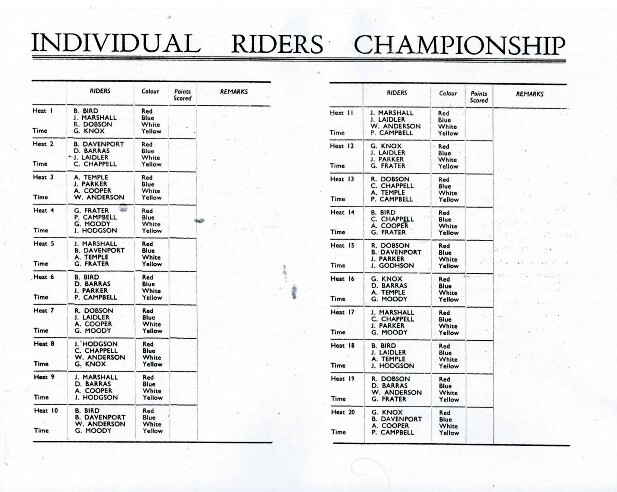 Edmund has come up with the Meeting Programme for what may well have been the first-ever Tyneside Individuals, held at the track of his club, Holy Cross Demons, in Wallsend Dene, in June 1949, and featuring riders from eight different teams - the five teams listed at the top of this section, plus Byker Stars, Wallsend Wasps and, an oddity, Penshaw Panthers. Penshaw village, whose monument features in the story of the Lambton Worm, is not even on Tyneside, but on the Wear, south of Sunderland. 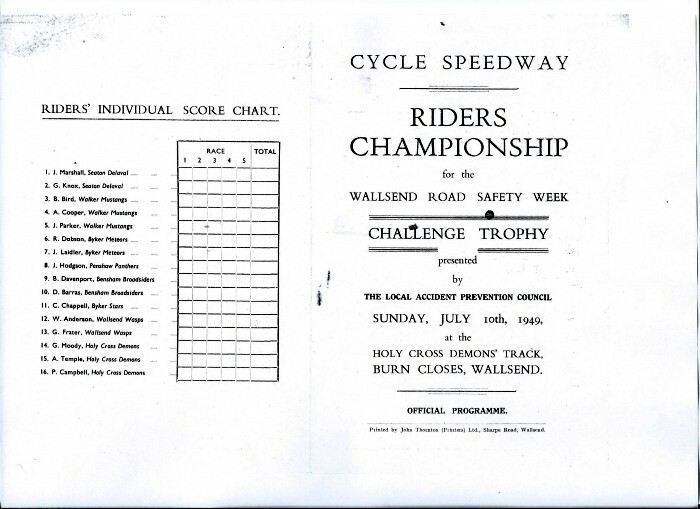 It was a strong field, and most of the riders' names already appear elsewhere on this site - Jack Marshall, Captain of the Seaton Delaval Rams, Alex Temple, who broke his toe during the home Test against Edinburgh, Archie Cooper, Jim/Jack Parker, and Peter Campbell who appears in one of the above photographs, but the favourite had to be Billy Bird, who top-scored in the Tests v Edinburgh in 1949 and also on the tour of South London in 1950. 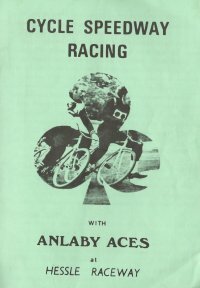 Unfortunately, the heat results were not recorded in the programme, and neither Edmund nor Archie can remember who won - maybe there's a copy of the local paper in an archive somewhere which may come to light one day. 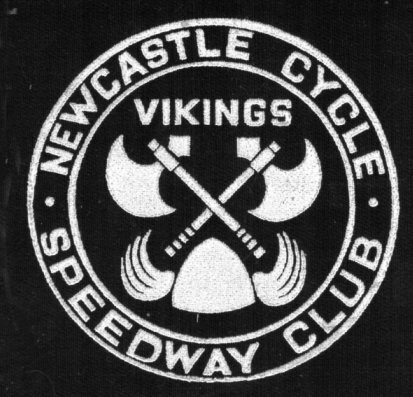 Frank Dodds, the Secretary of the East End branch of the Newcastle Speedway Supporters Club, wrote to the Cycle Speedway Gazette in November 1949 to tell them that his members had formed their own team and, calling themselves Newcastle Magpies, had raced a challenge match against Byker Red Stars, which they lost by only two points.